I did a lovely video interview with The Click Clack Boom at Rachael Ray’s Green House at SXSW, but Eminem was playing so loudly in the background that Team HRC decided to shelve the video due to quality control issues. So instead, I spent a lovely Friday night transcribing every word for you! Here’s what you would have seen, my conversation with Nathaniel Hoho (vocals and guitar) and Eric Miller (bass), after show 4 out of 7 at SXSW 2011. HardRockChick: What are you looking to get out of your 7 shows at SXSW? NH: We’re trying to play to as many people as possible. The music industry’s here, and we’re meeting a lot of people we wouldn’t have otherwise. It’s condensed with people we could potentially work with, play shows with. See great bands that we love. It’s a good vibe. And I love Austin. HRC: And you guys are based in New York? HRC: Can you tell me a little bit about the music scene in New York? NH: It’s huge, it’s very eclectic. It’s nice to be in a community where no matter where you go you’re going to see good music and there’s tons of bands. It pushes creativity, I think, just being there and being around it. HRC: But you’re from Pennsylvania? NH: Yeah, we grew up in a small farm town. Whenever I go to Pennsylvania I stay on a Bison farm- it’s owned by my grandmother. It’s much different than New York. HRC: So how do you think going from a place like that and then going to New York has affected your music? NH: Personally I just think it has opened me up to other artists. You see so many talented people that otherwise you wouldn’t get as much exposure to. Just different cultures and different styles of music because there just aren’t as many people. HRC: Tell me a little bit about your record Howling. NH: It’s a full length record on iTunes. It’s something that we recorded ourselves and worked on for about a year and a half. 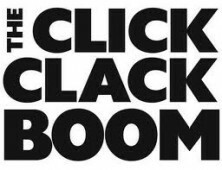 It’s the first thing we’ve released as The Click Clack Boom. We’ve done other projects before and done records. For this one in particular it kind of documents the growth of the band. From 2008 until now it’s a collection of songs that we’ve written and collected and self-recorded, self-produced. HRC: So you guys are on the road quite a bit- how do you pass time when you are on the road traveling? NH: I sleep as much as possible. A lot of bars….we’re always in bars, if we’re there we usually stick around. EM: We write really silly songs and sing. HRC: Can I get a sample? HRC: I notice that you describe yourselves as nomads in your bio. NH: It feels like that. We left Brooklyn in February and we won’t be back until May. It’s like that…I mean, we’ll be home for a month or two and then we’ll do it again. And it’s been like that for the last two years. It feels like being on the road is more like your home than when you get home. But it’s also nice to be home and see friends and family….chill out and have ‘you’ time. HRC: So I know you guys use social media a lot to promote yourselves…can you talk a bit about your connection with your fans and how you use different outlets to promote yourself? EM: We’re on twitter, myspace, facebook, we just started a tumblr too. NH: Pretty much all the normal stuff. EM: But we’ve found ways to get in and have fun instead of just shameless promo. EM: Well, like Twitter…just nonsense comments on other people’s stuff….that’s cool. NH: It’s good to connect with people and see what your friends are into. HRC: It’s a research tool. NH: But it also helps you get close with your fans. I dunno…there was a long period where I refused twitter, but we post things up, like what we’re doing once in a while, just to be out there. HRC: What do you guys have coming up- you’re on the road until May? NH: We’re heading West. We’re going to be working with a producer in LA- he’s doing some tracks. Then we’re heading back East and playing a few dates until April 2nd, and then we’re playing a show with- it’s kind of an odd fit- the rapper Kid Cudi…it’s a festival. So that should be fun. And after that we’re going into the studio in Lawrence, Kansas- we’re going to track some songs there…then we’ll maybe have a better idea of who we want to track our next record with. So that’s what we’re up to. Check out my review of one of the CCB SXSW sets here.